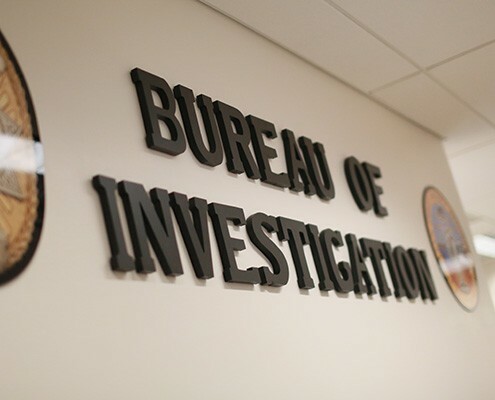 The Bureau of Investigation is the law enforcement arm of the San Diego County District Attorney’s Office. It is made up of eight divisions, which include 121 District Attorney Investigators, 49 Public Assistance Fraud Investigators, 13 Process Servers, 10 Paralegals and 10 Investigative Technicians. Chief Adolfo Gonzales and Assistant Chief Miguel Rosario, lead the bureau through their extensive law enforcement and management experience. 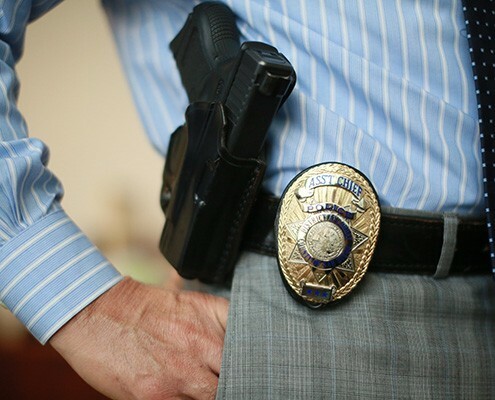 Together, they bring a fresh approach to the bureau’s core values. The bureau provides a full range of professional law enforcement investigative services in an effort to support the prosecutorial mission. 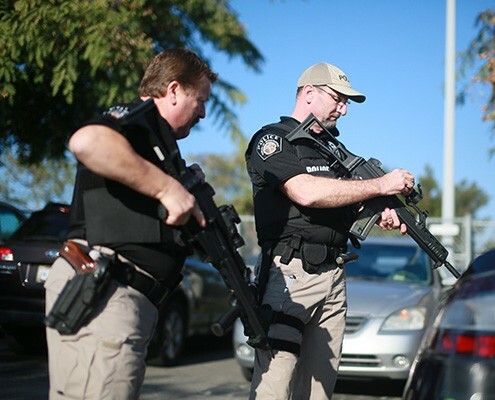 In 2014, the bureau recruited and hired 24 talented and experienced investigators from various law enforcement agencies throughout San Diego and Orange County. The bureau’s Child Abduction Unit conducted 168 investigations involving child custody violations. The unit successfully recovered 71 abducted children from around the world. Out of those recoveries, the Child Abduction Unit investigated 16 Hague cases involving children being abducted from or taken to other countries including, Mexico, Japan, Canada, Chile, France, and Scotland. In 2014, the unit’s Visitation Reporting System, which is accessible via the DA’s public website, tracked 2,439 reported violations. The staff also directly handled more than 1,223 public contacts in regards to child custody issues. Throughout the year, Child Abduction Unit staff represented the office though outreach presentations at San Diego area schools. Additionally, in an effort to educate local law enforcement agencies, we partnered with the California Child Abduction Task Force to present a child abduction training for first responding officers. The Special Operations Division investigated 12 officer-involved shootings in 2014, down from 16 in 2013. The Crimes against Police Officer’s Unit, which handles the vertical prosecution of serious and high profile crimes against peace officers, issued charges in 26 of 29 cases investigated. This has resulted in six convictions, with five cases pending preliminary hearing and 10 others pending trial. Central Elder Abuse Unit – This unit was formed as a result of a series of investigative articles in the local newspaper highlighting abuses at nursing homes and assisted living facilities for the elderly. The county funded a pilot program investigates crimes reported against seniors and adult dependents in skilled nursing facilities and assisted living facilities. A three phase plan was enacted for the new unit to assess incoming complaints, continue investigations of traditionally issued elder abuse complaints, and to become the primary investigative entity for all crimes reported against elders and adult dependents occurring assisted living facilities. The increase in reported crimes has been dramatic. Since July, the Elder Abuse Unit has initiated more than 66 investigations. The caseload consists of mostly financial crimes but also includes multiple homicides and other medical negligent death and great bodily injury cases. The unit has four investigators, three prosecutors and one paralegal. San Diego Violent Human Trafficking & Child Exploitation Task Force (VHTCE) – This task force was formed in response to a significant increase in human trafficking investigations throughout San Diego County. The purpose of the task force is to reduce the incidents of human trafficking in San Diego County and implement collaborative and countywide investigations and prosecutions of these crimes. The task force includes about 62 members from federal, state and local law enforcement agencies. A Deputy District Attorney and a District Attorney Investigator will be assigned full time to the task force. Office of Traffic Safety/Driving Under the Influence – This vertical prosecution team was developed to handle driving under the influence cases involving repeat offenders and crashes resulting in death or serious injury. Funding comes from a grant from the California Office of Traffic Safety. The team is led by Deputy District Attorney Cally Bright, who is highly trained to handle both alcohol and drug-impaired driving cases. Also on the team is an investigator with experience in traffic collision reconstruction. This unit will continue to successfully prosecute the most dangerous DUI offenders in San Diego County. The Public Assistance Fraud Division handled more than 24,000 cases in the Early Fraud Prevention program last year. Their efforts resulted in a yearly cost-avoidance of close to $3.2 million. Throughout the year, Early Fraud Investigators provided training to the Health and Human Services Agency staff, which included ride-a-longs to expose them to the work conducted by the investigators in the field. The Investigations Unit, which investigates allegations of fraud in Public Assistance Programs such as CalWORKs, CalFresh, Child Care, and In-Home Supportive Services, closed 584 investigations. These investigations identified overpayments totaling $1.8 million and referred 196 cases for administrative collections and 114 cases for prosecution. The unit also dedicated one investigator to the In-Home Supportive Services Program Integrity Unit. This unit ensures the proper services are being delivered by the providers to the elderly and disabled clients. In 2014, the unit responded to 7,198 Child Protective Services requests for criminal history checks prior to placement. They also reviewed and closed 5,620 requests in response to the Fleeing Felon program and the Nationwide Prisoner and Deceased Person matches. Investigators also assessed 1,872 hotline calls from the public, which resulted in 292 fraud referrals. The Subpoena Witness Coordination Center is staffed with a process server supervisor, a bureau paralegal, 13 process servers and two couriers. Their assignments include the Hall of Justice and the El Cajon, South Bay and North County branch offices. The Subpoena Witness Coordination Center plays a major role in the bureau’s success by providing vital support to the investigators in serving subpoenas, picking up non-original evidence and transporting witnesses to and from court. In 2014, the center served 7,527 subpoenas office wide. They also conducted 399 witness transports and 893 evidence pickups. Trial Support Services provides courtroom support to prosecutors including graphic design expertise, audio/visual expertise and fingerprint identification expertise. Their mission is to provide effective and timely mixed-media courtroom assistance, which helps in presenting facts and evidence during trials. The department is made up of one supervisor, a discovery clerk and 10 investigative technicians with differing skill sets. This group also offers support for various outreach programs and the DA’s Communications Team. Projects in 2014 included press conference design, logo development, podcasting, training videos and various print media designs, which proved to be an efficient and cost-effective way to complete various DA initiatives. In 2014, TSS began honing their skills with 3-D modeling and animation and worked directly with the Medical Examiner’s Office to develop digital mannequins. This powerful tool helped the Medical Examiner and Deputy District Attorneys communicate more effectively with the jury in helping them understand the facts of the case. In 2014, the Bureau of Investigation continued its commitment of developing community partnerships. Once again, it partnered with lowrider car clubs, local businesses and school districts to adopt 18 families throughout the county during the holidays. The Public Assistance Fraud division held their 2nd annual holiday gift drive benefiting preteens and teens at the Polinsky Center. With the generosity of District Attorney employees, other county employees, local businesses and community organizations, they provided 44 gift baskets. For the first time, the bureau participated in two additional community events – the Latino Police Officer’s Association dinner and bicycle giveaway where a total of 100 children were selected to receive a Thanksgiving dinner and bicycle, with an additional 15 families receiving turkeys and miscellaneous meal items for Christmas. The second event involved the Walk Like MADD fundraiser and walk for the Mothers Against Drunk Driving charitable organization, with the bureau raising over $1,000.